January 1951, the UNC decided to isolate captured personnel on Koje-do, an island off the southern coast of Korea. Col. Hartley F. Dame, the first camp commander, had to build dams and store rain water to service the 118,000 natives, 100,000 refugees, and 150,000 prisoners. by the end of the month over 50,000 POW's were moved from the mainland to Koje-do. Four enclosures, each subdivided into eight compounds, were built. Originally intended to hold 700-1,200 men apiece, the compounds were soon jammed to five times their capacity. The space between the compounds soon had to be used to confine the prisoners too, with only barbed wire separating each compound from the next, permitting free communications between all the prisoners. With the number of security personnel limited and usually of inferior caliber, proper control was difficult at the outset and later became impossible. Outbreaks of dissension and open resistance were desultory until the negotiations at Kaesong got under way. September 1951 fifteen prisoners were murdered by a self-appointed people's court. Three more were killed when rioting broke out on the 19th in Compound 78. The camp commander was not permitted by his superiors in Washington to institute effective disciplinary control. December, 1951, rival factions - Communist and anti-Communist - vied for control of the compounds. A large-scale rock fight between compounds on 18 December was followed by riots and demonstrations. Fourteen deaths and twenty-four other casualties resulted. February, 1952, Compound 62 refused UN access for prisoner interrogation (screening). February 18: 3rd Btn 27th Infantry moved in and were attacked by over a thousand prisoners, armed with improvised weapons. The 27th opened fire, killing fifty-five prisoners immediately, 22 more dying at the hospital, with over 140 other casualties. The 27th lost 1 killed and 38 wounded. March 13, 1952. 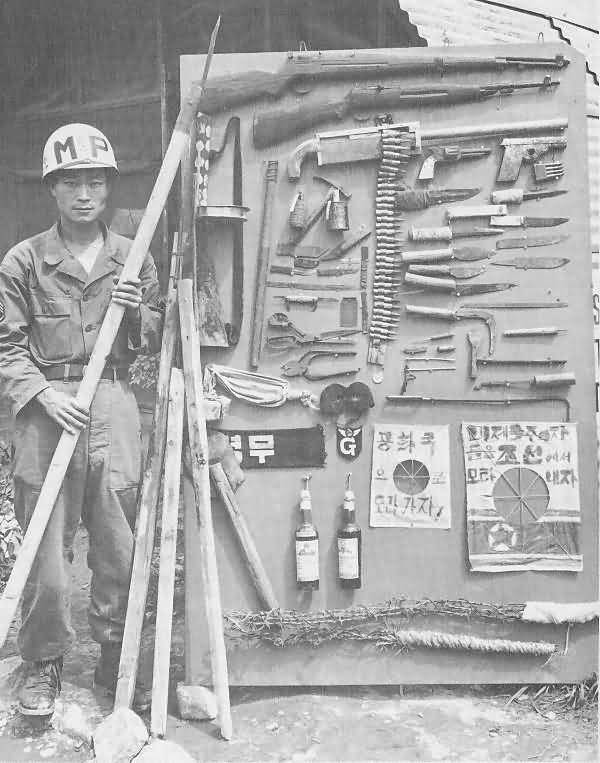 An anti-Communist detail and their ROK guards, while passing a hostile compound, were stoned. Without orders the guards retaliated with gunfire. 12 prisoners were killed and 26 were wounded while 1 ROK civilian and 1 U.S. officer, who tried to stop the shooting, were injured. May 7, 1952. General Dodd, the camp commandant, lured to the unlocked gate of Compound 76 on pretense of discussions to ease camp tensions, was violently set on and captured. Rather than forcing a military solution which would have cost the General's life as well as that of untold numbers of the prisoners, replacement commandant General Colson and the reinforced 38th Infantry Regiment sat and watched as the communists put General Dodd on trial on criminal charges for abuse of prisoners, a farce unequalled in modern military history. May 9, after comic-opera negotiations, with real lives at stake, General Dodd was released. Subsequently, both Generals Dodd and Colson were reduced in rank to Colonel. Brig. Gen. Haydon L. Boatner, assistant division commander of the 2d Division, was appointed new commander of Koje-do. June 4, 1952. 38th Regiment infantry, supported by two tanks, quickly smashed through Compound 85 and Compound 96, rescuing 85 anti-communist POWs, without casualties. June 10, 1952. Paratroopers of the 187th Airborne RCT moved into Compound 76 without firing a shot. Using only concussion grenades, tear gas, bayonets, and fists, they drove or dragged the prisoners out of the trenches they had built within the compound. As a half-dozen Patton tanks rolled in resistance collapsed. Colonel Lee was captured and dragged by the seat of his pants out of the compound. During the two-and-a-half-hour battle, 31 prisoners were killed, many by the Communists themselves, and 139 were wounded. One U.S. Paratrooper was speared to death and 14 were injured. Leaders of Compounds 78 and 77 swiftly agreed to do whatever Boatner wanted. In Compound 77 the bodies of sixteen murdered men were found.